How many black pebbled leather bags should one person own? Clearly I am unqualified to answer this question, as I currently own a number that I don’t know off the top of my head and wouldn’t disclose if I did. But I can say that when someone claims this bag, I’ll have one less. 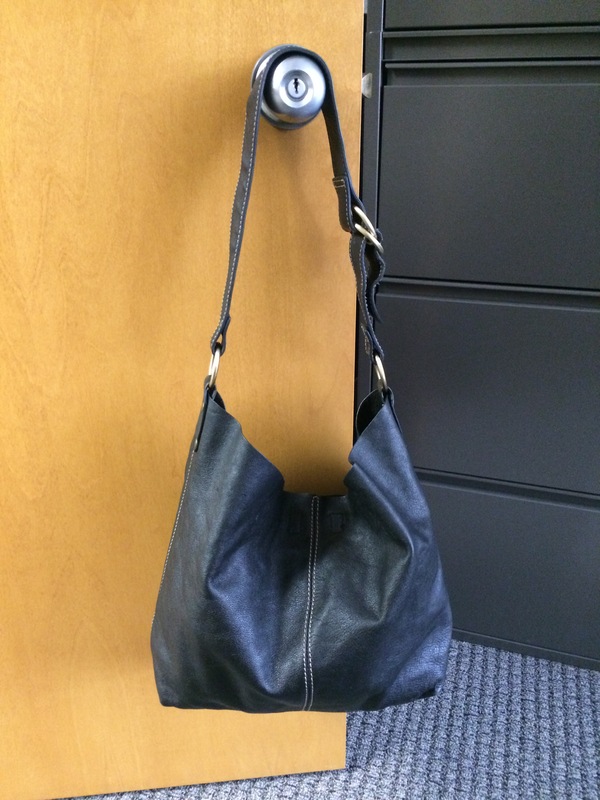 Black, pebbled leather, whipstitching, hobo – the quadfecta of bags for me. 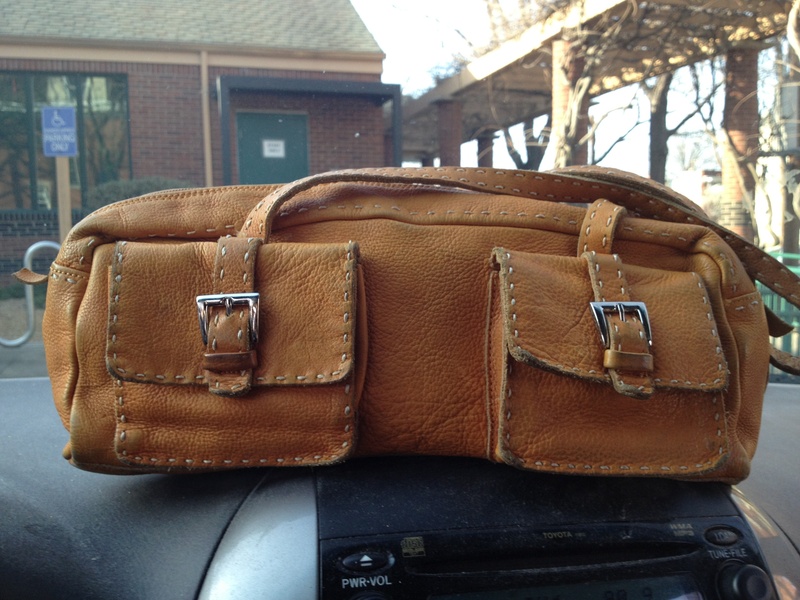 This one is super-soft leather with a snap closure and absolutely NO interior organization, which is it’s downfall. I have lost many an item in this black hole of a bag. 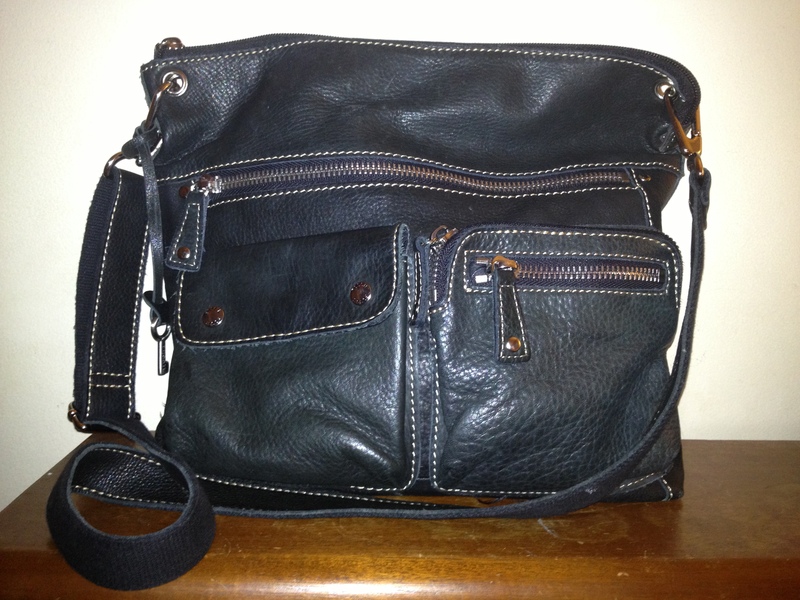 I got this one at TJ Maxx many years ago, and happily have found other bags with more pockets and pouches. 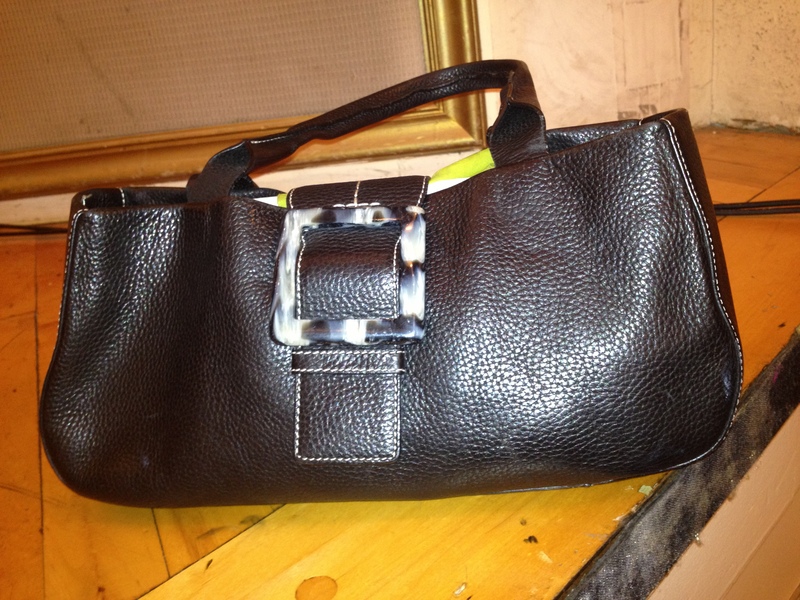 This is a great bag if you carry a smaller purse and a lot of other stuff and need one bag in which to put it all. Email 50favbags@gmail.com if you’re interested. One of the hard parts about this giveaway is having to tell some people no, the bag is already taken. Once a librarian, always a librarian – I can’t quit unless there’s an answer, a solution, that everyone likes. Once a teacher, always a teacher – I want the right person to get the right bag when they need it. But what i’ve learned so far is that there isn’t always a right answer, or a good answer. I can’t always say yes, I’ve solved it. But I can keep working, keep looking, keep trying. Or, I can stop. And sometimes, that’s ok too. 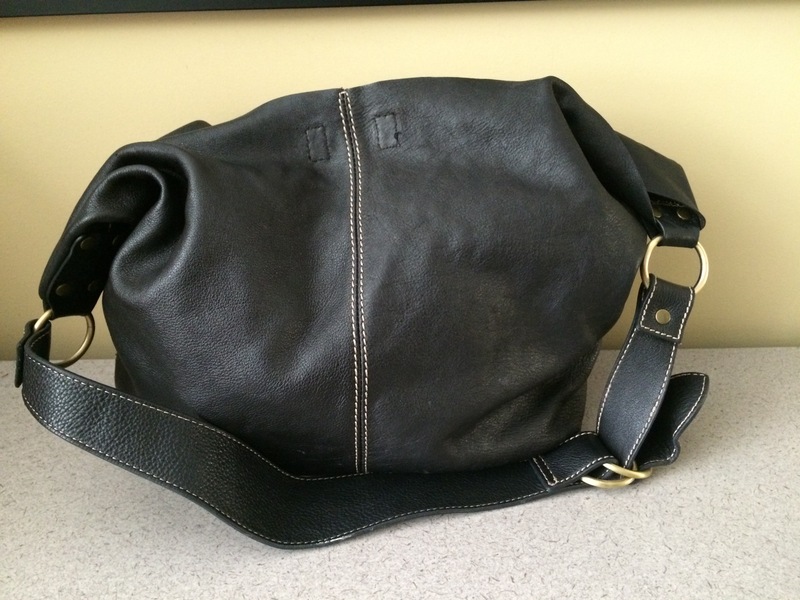 This entry was posted in 2015 Lent bag giveaway and tagged black, giveaway, hobo, Leather, tj maxx, whipstitched on February 27, 2015 by miriamgmck. when i have multiple events in a day, like going to work then going to a concert, i have to think extra hard about what to use. normally i would switch bags for the evening event, but with this challenge i wanted to see if, like previous days, i could make it work. well, it mostly did. it was perfect to see my daughter on stage at Music Hall for the May Festival opening concert. i had no idea how thrilling it would be to see her on that stage. i am so happy for her, and i’m also charged that it’s a memory we can share. i once sang on that stage too. hers is much much more cool. for work, i ended up using another bag to carry my water bottle and friends in to work. at night, though, i had 2 magazines and an umbrella in there after kicking my lipstick/emergency bag to the curb. whatever, it’s a small price to pay. this bag is so cool. this Adrienne Vittadini was hanging on the back rack in st. vincent de paul near my house. i saw the leather and it looked, real, so i touched it and, being proven right, moved on to my other tests: look for unique features, or superior quality – both is best, which is the case with this bag. ok, so it’s black pebbled leather. but look at it: the buckle and zipper pull made of horn, a divided inside with a middle zipper pocket, and three more pockets & pouches. the whipstitching is beautiful, the sides and bottom are reinforced with extra leather so that it stands up with nothing in it. check out the strap detail – a very modern approach to what could have been boring – wide at the bottom but wrapped and stitched creating layers of pebbled leather comfort. taking note of these details, i then inspect for wear and function. will i be able to work this into my wardrobe? am i inspired by it? is it beautiful? does it serve me? at $4.99 the answer was E, all of the above. This entry was posted in thrifting and tagged Adrienne Vittadini, black, buckle, horn, Leather, May Festival, May Festival Youth Chorus, st. vincent de paul, thrift store, thrifting, whipstitched on May 11, 2013 by miriamgmck. some people refer to my alma mater as a cult. those people are usually haters who did not attend Walnut Hills High School, one of the best high schools in the country. it’s one of the reasons my east coast husband will live in cincinnati – so his kids can attend. after running into a high school friend of mine at his work in new jersey 20 years ago, he started to understand that Walnut is special. well, we have a daughter who is a senior, and she’s about to graduate from this amazing institution. i’m so proud of her. so today, i carried the bag she chose for me last weekend that i rejected, and took these photos at her senior ensemble concert held earlier this evening. (bag: goodwill, $8) this is a new wing of the school – when i attended, it was known as the annex – language classes, honors, and lest i forget – typing class. it’s so beautiful now, and i’m happy that these kids have a beautiful school in which to learn and hang out with friends. high school was a wonderful time of my life. i did honors and choir, yet i wasn’t a total nerd. i had a great 6 years. i have no desire to go back, or have doovers. i’m just so thankful and glad my kids are there. this year was a fun year with one as a senior and one as an effie – that’s 7th grader to you civilians. so i’ve got 5 more years to embarrass the crap out of her! whoooooooooo! go Walnut! 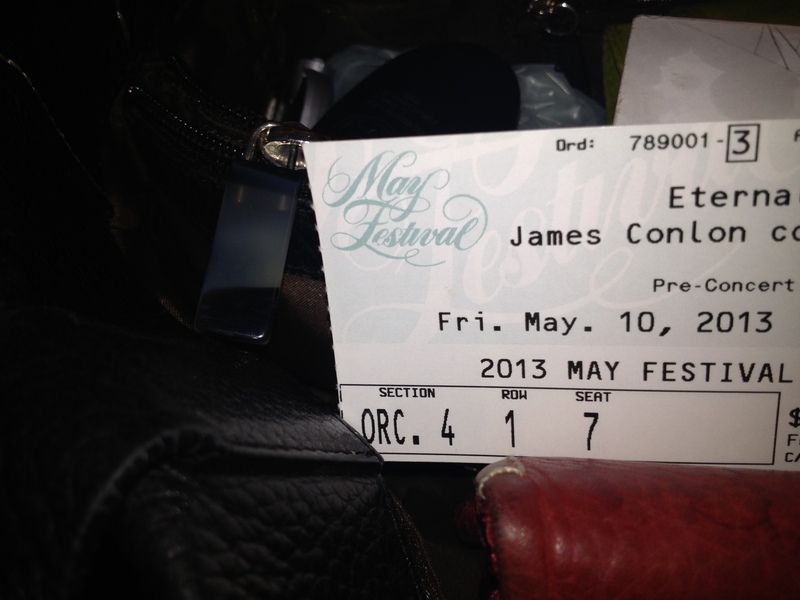 This entry was posted in thrifting and tagged alumni, black, choir, Cincinnati, concert, daughters, Goodwill Industries, Handbags and Purses, High school, pebbled leather, senior, Shopping, the sak, thrift store, thrifting, Walnut Hills High School, whipstitched on May 1, 2013 by miriamgmck. confession: i hit my favorite goodwill hard yesterday. it was purse city in there. before i knew what was happening, i had maybe 10 or so bags on my arm for closer inspection. there were so many good bags i had to leave behind… i’m trying to not “rescue” bags from goodwill anymore. i left with three, and this was one of them. so by now you know i have a thing for pebbled leather, grommets. but have i mentioned my zipper test? the mark of a truly quality bag is that the zippers zip and unzip smoothly. in fact, i have a one handed test – if i can zip and unzip the zipper without having to hold the bag, it’s usually a high-end bag and i will likely own it. try it with your bag(s). calvin klein really knows his zippers. so does fossil, maker of this bag. they just get it so, so right with the hardware. not garish, like some bags i won’t mention by full name (kvz) but tastefully obvious. i haven’t even mentioned the myriad pockets and pouches, and it holds my stuff, water bottle and magazines. $12, but half off means i paid $6. what! another score! i try not to get too excited when i’m in the store, but when i got to the car i was a purse zipping fool. yes, people, it truly is the little things. and now, three other black pebbled leather bags are in a pile of bags to go. feels good. 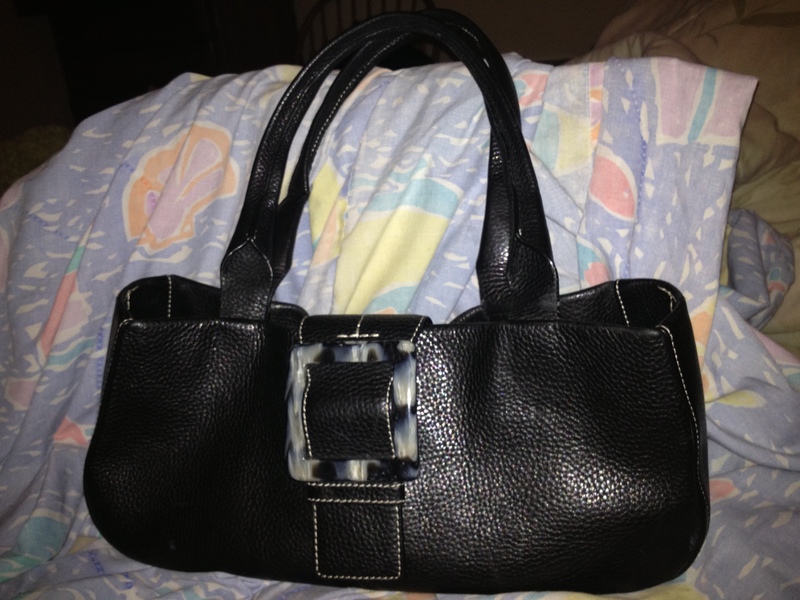 This entry was posted in thrifting and tagged black, calvin klein, donation, fossil, goodwill, Handbags and Purses, hardware, pebbled leather, Shopping, thrift store, thrifting, whipstitched, zippers on April 16, 2013 by miriamgmck. time to return to a thrifting success. 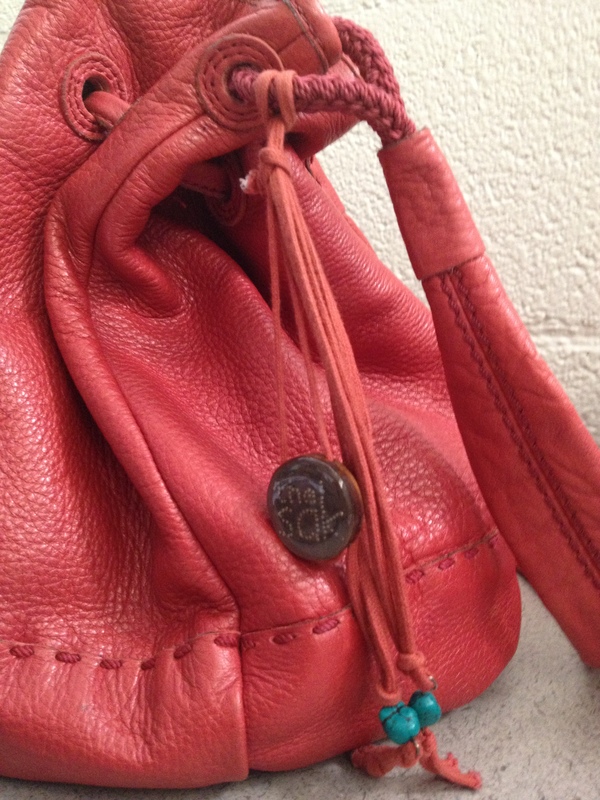 i was in my favorite st. vincent de paul when i saw this coral hobo by the sak from the checkout line. i almost didn’t grab it, because it looked a little small. boy, was i wrong. this bag holds a lot! my stuff, water bottle, coffee mug and a magazine – heaven. the handle is whipstitched and lined, with a cool rope detail and hanging beads. the color looks great with all neutrals. i’m so glad i didn’t pass it up at $6.99! so maybe a week later i find this purse in a different color, same purse though, at tj maxx for $59.99. score! i took this photo at work, because i want you to know that i’m not just choosing my favorite bags, i am actually carrying that bag for the whole day. i usually switch in the morning, after staring at my closet trying to figure out what i’m going to wear and what purse goes with that, or choosing the purse and then figuring out what to wear with it. regardless, there’s a lot of staring. 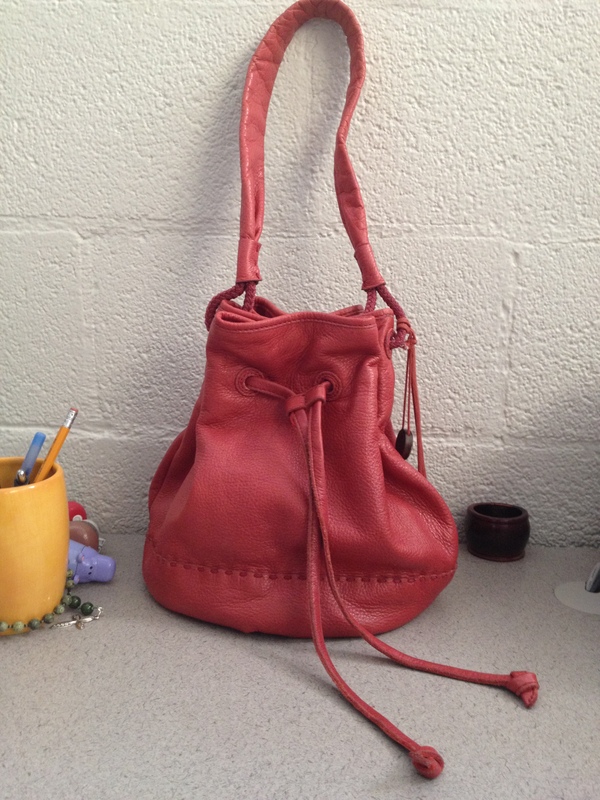 This entry was posted in thrifting and tagged bargain, coral, Forward Movement, pebbled leather, st. vincent de paul, the sak, thrift store, thrifting, tj maxx, whipstitched on April 10, 2013 by miriamgmck. i don’t remember when i got this, which means probably around 10 years ago. (coincidentally, i my youngest is almost ten.) i also can’t remember how much i paid for this bag. but whatever it was, i have gotten my money’s worth. my rule is never more than $40 unless i feel it will have a very low cost per wear. calculating cost per wear is a way to justify spending a little more on a quality bag that you really like. let’s say a bag cost $50. if you wear it 10 times in a year, divide the cost by 10 and you’ll have your cost per wear, or $5. if you keep it multiple years, then the cost per wear keeps going down. 5 years x 10 wears per year = 50 wears, so $1 per wear. 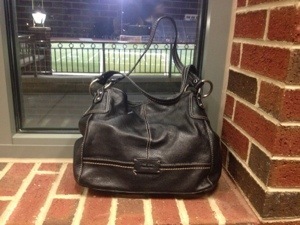 by now, this purse cost 50¢ per wear, or less. well worth it. This entry was posted in tj maxx and tagged Carla Mancini, cost per wear, Leather, mustard, Oakley Library, pebbled leather, Shopping, tj maxx, whipstitched on April 9, 2013 by miriamgmck.